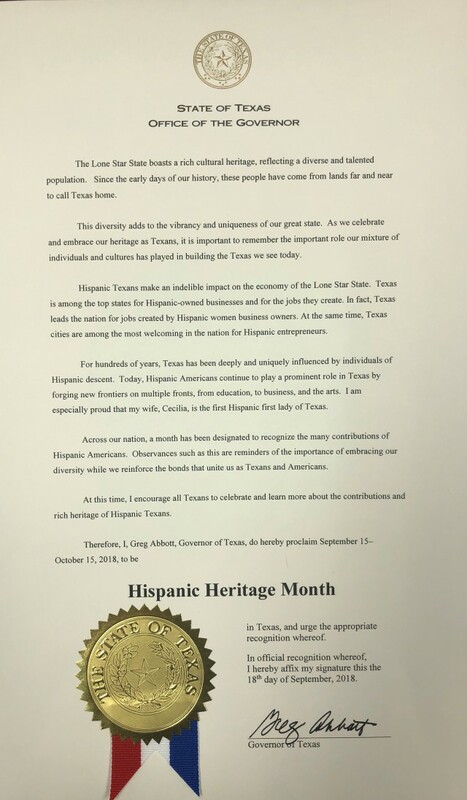 During Hispanic Heritage Month, here in Texas we celebrate the many contributions to the Lone Star State that Hispanics have made, but in particular I want to emphasize the indelible impact that Hispanics have had on our state’s economy. Texas is among the top state for Hispanic-owned businesses and for the jobs they create. In fact, Texas leads the nation for jobs created by Hispanic women business owners. At the same time, Texas cities are among the most welcoming in the nation for Hispanic entrepreneurs. One of the organizations that has cultivated and promoted the hugely important influence that Hispanics and Hispanic-owned businesses have had on the Texas economy is the Texas Association of Mexican American Chambers of Commerce (TAMACC). I had the good fortune of attending their annual conference earlier this month in San Marcos, and addressing their Latina Empowerment Luncheon. TAMACC is Texas’s leading Hispanic business organization. Since 1975, TAMACC has been working to increase economic opportunities for Hispanic businesses. It has a membership of over 15,000 business and is the leading advocate for over 700,000 Hispanic-owned businesses in Texas. I was honored to have the opportunity to speak to attendees about the profound positive impact that Hispanic owned businesses have had on our state and the important role they play in the future success of Texas. Texas has been deeply and uniquely influenced by individuals of Hispanic descent for hundreds of years. And today, thanks to the contributions of organizations like TAMACC, Hispanics continue to play a prominent role in Texas by forging new frontiers on multiple fronts, from education, to business, and the arts. At this time, Greg joins me in encouraging all Texans to celebrate and learn more about the contributions and rich heritage of Hispanic Texans, and the successes they have brought to this state. Success is contagious, and with strong partners like the Texas Association of Mexican American Chambers of Commerce, I know our successes as a state will continue to grow.